Tree pruning is an art as well as a science. It can either help or hurt a tree. It is important that a tree trimming crew has both good training and good judgment. Our pruning / trimming crews are supervised by an ISA Certified Arborist, and we follow ISA Standards and Practices, ANSI A300 Pruning Standards, and ANSI Z133 Safety Standards. We believe in a less-is-more approach, and we will always choose to leave green material on the tree unless there is a good reason to remove it. Tree pruning and trimming may be broken down into many sub-categories: weight reduction, crown reduction, dead wood removal, roof clearance, canopy raising, structural pruning….the list goes on. Most pruning jobs are a combination of several of these. In our opinion, each cut should be justified. After that, it must be executed correctly. All interior green growth should never be stripped from a tree (a practice called lion-tailing). "Topping" is also never an acceptable pruning practice. There are better ways of reducing the height of a tree if absolutely necessary (see crown reduction below). 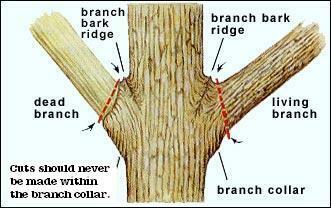 A pruning cut should be made just outside the branch collar – not flush to the trunk, but not so long that a long stub remains. Dead wood removal: Removal of dead wood can serve many functions. It can reduce liabilities by eliminating large dead limbs that are at risk of falling and injuring people or property. It can, in cases of dense dead wood, improve tree health by improving air circulation throughout the tree canopy. Finally, it improves the aesthetic appeal of a tree by eliminating unnecessary and unsightly dead wood and creating a more clean and open look. Building clearance and roof clearance: Clearance consists of pruning trees so as to prevent damage to your roof or building from contact with tree limbs. Where possible, Live oak limbs are pruned back to at least 3' from any structure, and other species are pruned back as far as 4'. This allows enough space between trees and structures so that, with normal growth, the procedure should not need repeating for at least three years. Keep in mind that if a judgment call needs to be made regarding a large, healthy limb, our crew chief will act in favor of the overall health of the tree, rather than an overly strict adherence to this specification. Weight reduction: It is occasionally necessary to reduce the amount of green material at the end of the limb. This is usually done due to concerns about breakage on long, heavy limbs that overhang structures or high-traffic areas. Structural pruning: Pruning a tree to correct structural issues is best done when the tree is young. Rubbing or crossing limbs should always be eliminated if possible. A well-formed tree should have well-spaced branches with scaffolding attachments, a full, symmetrical crown, and a strong central leader (except in the case of multi-trunked species.) This form can be encouraged in young trees by judicious pruning. We advise our clients to aggressively and deliberately train their young trees now, in order to avoid contending with large structural defects once the tree is mature. Crown reduction, also called drop-crotch pruning is typically reserved for situations where a tree has grown too tall for its available space (beneath a power line, for example.) In Austin, tree trimming around power lines is frequently performed by the utility companies, often with less than optimal results. We recommend crown reduction in lieu of topping when the height of a tree must be reduced. Note, however, that crown reduction should still be considered a method of last resort, since the required cuts are often aggressive and prone to secondary problems such as decay. Crown thinning: The selective removal of live wood can help to improve light and air penetration when a tree canopy is exceptionally dense. In Austin, we are rarely required to do this because, with a few exceptions, our native species do not tend toward particularly dense canopies. Also, Austin tree trimming rarely involves thinning simply because most folks want to preserve as much of their shade as possible!